The fun days of summer continue, but so does the heat! While we all have our favorite ways to stay cool, one of my favorites is chilling with a yummy and frosty fruit popsicle. 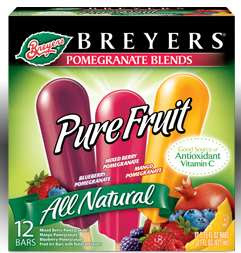 And although there are tons of popsicles out there that are worthy of trying, I have become particularly fond of Breyer’s Pure Fruit Bars. The name says it all. Pure fruit taste with every bite…or should that be with every lick? There are two varieties of Breyer’s Pure Fruit Bars that particularly attract my taste buds. The first is basic fruit bars that contain three flavor choices - you get strawberry, raspberry and tropical flavors. Then there’s the pomegranate blend bars that offer the exotic taste of pomegranate (which I love) along with blueberry, mango, or mixed berry. Talk about a sensation for your tongue! You can find these mouth-watering frozen delights packaged in twelve bar boxes or as single serve treats. And the good news is, they are available in your grocer’s freezer without the need to head to a specialty foods store. Yep, gotta love the guys at Breyer’s for recognizing that the health-conscious crowd is growing, and we demand flavorful but healthy treats! These bars are low, low calorie – just 40 calories per serving with absolutely no fat, which means there’s no trans-fats or saturated fats to worry about. So they are just one weight watchers point, so a perfect addition to any day. And they are cholesterol free! They contain only 9 grams of sugar per serving and provide ten percent of the RDA of Vitamin C that you need in each bar. I have found that when I have a craving for something sweet that a Pure Fruit Bar is just what I need to feed those cravings without having to feel guilty about it later. And during these last sweltering days of summer, these bars are perfect to give to your kids without filling them full of sugary popsicles that are made with high fructose corn syrup. They won’t know the difference! PS. I also love these other low calorie fruit bars from Dreyers. I love popsicles ... so much fun for so little calories. I often choose a popsicle over ice cream to save on the fat too. Love that these are all natural. I'll look out for them. Thanks! These are the best! My hubby and are addicted!